Are you aware of the Inktober challenge that will soon take place on the Internet? No? Well, it’s as simple as this: one drawing per day during all the month of October, without any restriction except maybe the medium used, ink. Every year, several artists are gathering together around the #inktober hashtag and this event is the perfect occasion for me to discover new talents that I”m happy to follow for the rest of the year. Needless to say, 2017 won’t make an exception, and I can’t wait for the challenge to begin, so I can lose myself in the social media searching for new illustrations that will bring me light and joy (and with the days growing shorter and shorter, I can use this sort of medication). Ok fisrt, little highlight here on three artists that I love, and that I hope to see participate this year: Sieskja, Miss Nettle and Movezerb. You can follow them by clicking on the links. Some of them are French-speaking, but you don’t need to understand it to be amazed by their gorgeous illustrations. Now go! 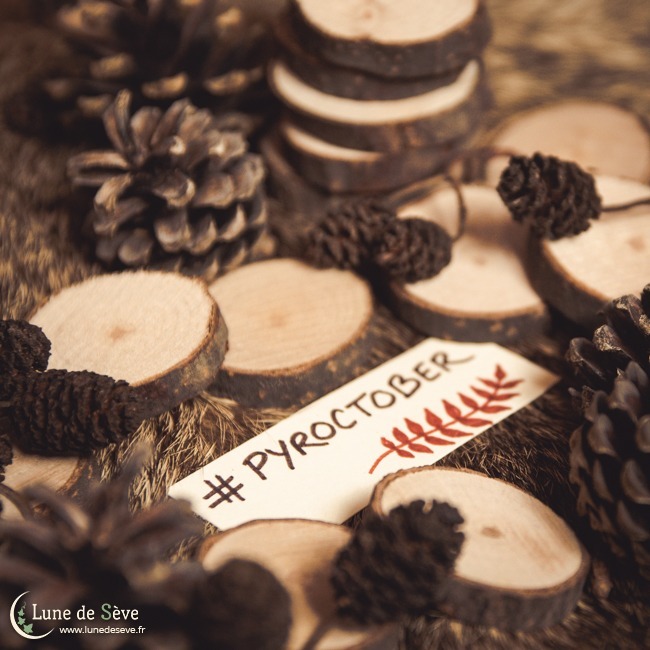 Pictures of the 2016 Inktober Challenge are waiting for you there. 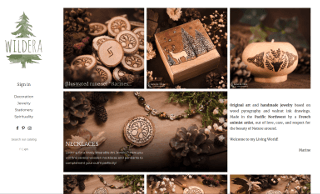 The idea is as simple as the original challenge: I’ll make a daily pyrography, which I’ll present you in the form of a natural wooden talisman. I already have many ideas of drawings to fill this month of October of wild treasures of all kinds. But I’m also going to allow myself to just follow the daily inspiration and what will come to my mind when the time comes. Fall season is always so full of surprises and inspiration that it’d be a foolish mistake to deprive myself of it, isn’t it? The wooden talismans I’m going to create will be listed on the shop throughout the month, so you can purchase them if one does resonate with you. I’ll also add a special photo album on the Facebook page to regroup the 31 pyrography made during the challenge. 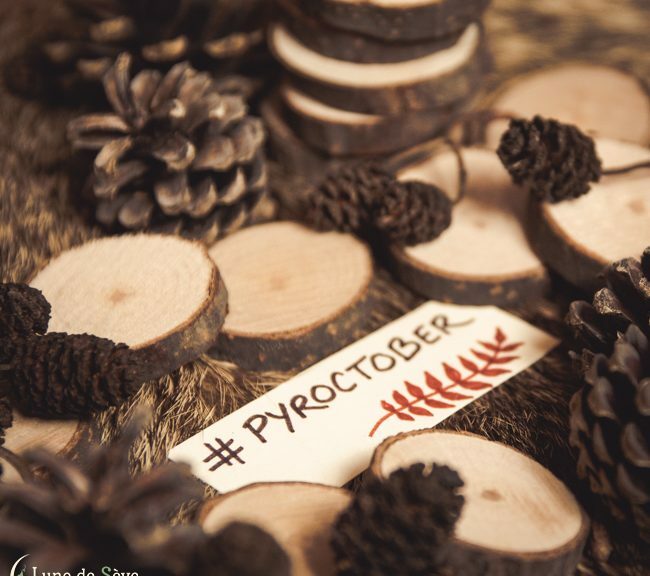 Don’t hesitate to follow the #pyroctober hashtag on Instagram too if you want to see daily pictures of them. I have a couple more ideas that I’ll probably develop while I’m progressing on the challenge, but I won’t talk about it right now. I just got my mind into this thing, and I’m kind of late considering that the challenge will begin in a few days. So I didn’t have the chance so far to really gather my thoughts and really plan for it to happen. It’s kind of messy, but hey, let’s say spontaneity will be the word for this one. See you next Sunday for the beginning!